Fair Trade, pure, unrefined, and 100% natural, our Shea Butter has been carefully handcrafted using centuries old techniques that maximize the moisturizing and protective properties of Shea Butter. 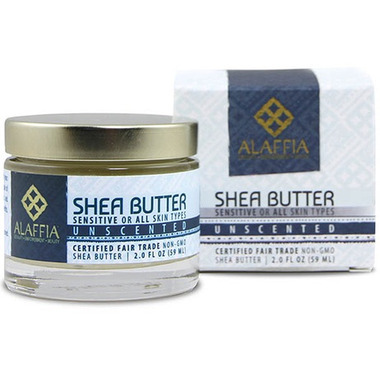 Shea Butter has been a staple of African skin care for millennia. Shea Butter's unique fatty acid profile and high content of vitamins E and A contribute to its protective and hydrating properties. Our Handcrafted Shea Butter is unrefined for maximum protection and hydration, has not been altered in any way and contains no added chemicals, preservatives or dyes. Unscented for sensitive skin. Warm small amount of Handcrafted Shea Butter in palm and apply to skin or hair as desired. Allow few moments for shea butter to absorb. Handcrafted Shea Butter may also be used for massage. Keep unused shea butter in cool and dark location. My baby has very bad eczema on his back and stomach, and this works AMAZING ! it cleared up in just over a week ! And we tried everything !! It is definitely not a lotion, it is quite hard ! I love the smell it is nutty and pure ! I wish they sold this in much bigger jars ! I do like that it's pure and unrefined. It is quite hard, but it melts when you warm it up with your hands. The only thing that I didn't like was the scent. It smells like sunflower seeds which I don't normally mind the smell of, but not a scent I enjoy applying on my face or anywhere on my body. Exactly what I wanted for my face and hands when they are dry. No waxes or perfume added. Just a little required. Perfect.